What’s happening in South Florida’s Luxury Real Estate Market? Breath-taking architectural design, cozy interiors, and mind-blowing automation. Spear-heading the innovative effort is the power team of Property Markets Group and our own Acoustic Architects. PMG’s Brian Koles gave us the inside scoop on smart technology and the most coveted luxury properties in South Florida. Brian is the Director of Brand and Experience with Property Markets Group. The Principal members of the Chicago and Miami offices sought out Brian in an effort to elevate the brand’s hospitality mindset. As a seasoned start-up professional, Brian is the perfect fit to help PMG create a convenient and fun loving experience across the company’s unitque portfolio. Take a look at what PMG has in store for beautiful South Florida. AA: How has the focus on Brand Experience elevated PMG in the luxury property market? BK: Brand Experience sets PMG apart because it brings the hospitality component to property development. We look for every opportunity to create a unique experience for our residents, from the interior design to the food and beverage offerings in the common areas. Our communities are gorgeous, social, and convenient. AA: What else sets PMG properties apart as fresh and innovative? BK: We tend to stay away from the generic ideas. Technology is a giant piece of that. Aside from luxury, we offer a full smart home experience. Our residents value and enjoy the automated features of their unit at move-in. Smart locks, lighting, shading, audio, and athletic equipment are just a few examples. WiFi is everywhere. Fitness centers, pools, and other common areas are accessed via the residents’ phones for the ultimate keyless experience of connected living. AA: What are the characteristics of buyers in the South Florida market? BK: People here are looking for a completely finished out, luxurious, modern space. For many, it is a second home or a vacation condo. They also want great views and the latest in home technology to enhance their lifestyle. AA: What are the unique expectations of buyers in the South Florida luxury market? BK: Excellent service down to the greeting they receive when they enter the building, with luxury hospitality at every turn. Our residences offer a move-in ready experience with absolute convenience. They also have great views and a ton of thoughtful little touches. An on-site service team is available to make sure our residents’ expectations are met. AA: What are the current trends that you see in Home Automation? BK: Curating varied technologies while keeping aesthetics and controls unified. For example, lighting and shading from one company can be paired with a thermostat from a different company. Light switches are disappearing. Touch and voice control is the new norm. Expectations are that a developer stays at the forefront of technological evolution. AA: What are the after purchase user expectations you encounter? BK: Owners of luxury properties want easy to use automation. They don’t want to have to call in an IT pro to make a change, and they don’t have to with our properties. The units are set up with the right infrastructure to handle changes and upgrades. AA: How do you see Home Automation adding value to the buyer experience? BK: It adds value by saving time that is otherwise taken up by small tasks like programming the thermostat, managing multiple light switches, manually raising the shades, or walking over to the stereo system. The user saves their own energy and stays cozy while doing it. AA: How do you see Home Automation adding significant investment value to the luxury real estate market? BK: A Condo is an investment. Having tech built in preserves as well as increases value. A unit with technological infrastructure included provides an upper-edge to the owner. AA: What are the advantages of working with the team at Acoustic Architects? BK: We’ve worked with the team over the past 3 years. When you talk tech with Acoustic Architects, it is entirely relatable. Team members also show up on time, get things done within budget, and communicate incredibly well. Options are presented in easy to understand terms, which helps us at PMG know where to invest or avoid investment. Acoustic Architects designers create robust and elegant solutions. When we are tasked with outfitting tens of thousands of square feet with top-of-the-line amenities…or even in the case of integrating a small space like a studio apartment, we get extensive information on the range of technology available to make a well-informed decision on every space. AA: Why would you choose Acoustic Architects over other automation integrators? Tell us about the synergy that comes from partnering with Acoustic Architects? BK: PMG has been approached by everyone else, and there is never even thought of entertaining it. We’ve done five large projects with Acoustic Architects and we still like working together. That tells you something right there. 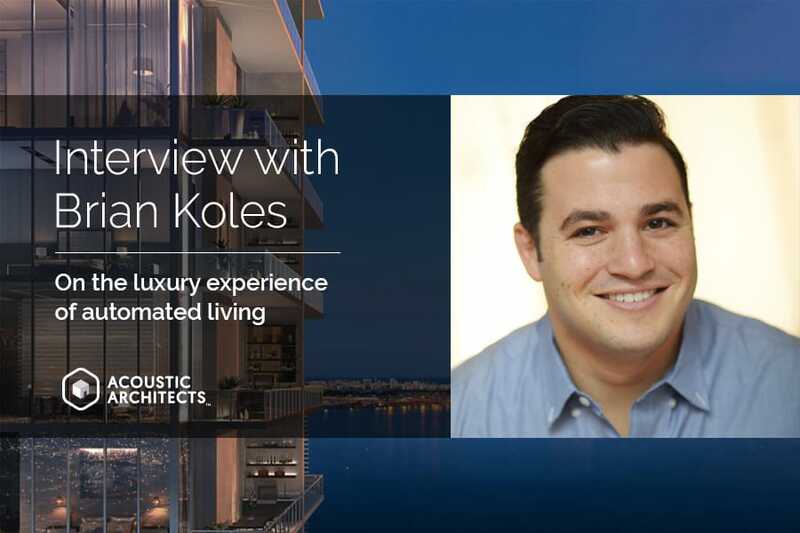 AA: Can you tell me about Acoustic Architects’ hand in the automated designs for Echo Brickell, Muse, and X Miami? BK: Echo Brickell & Muse are fully integrated smart homes. With a central Savant hub, residents can upgrade as they desire, using Acoustic Architects as an in-house smart home partner. They do the initial orientation and present the resident with ultra-lux options. X Miami has quite a few different zones in the layout. It is an incredibly large space. The team at Acoustic Architects has helped the staff manage the various technological features of such a vast quantity of square feet, which helps us provide an excellent social experience for our residents. AA: Tell us about other projects currently in the works? BK: Currently in development is X Las Olas in Fort Lauderdale. We will also complete the first of three luxury residences in Denver, in mid-2020. And we’re rolling out a national portfolio of X Social Communities in Orlando, Denver, Phoenix, and Oakland, with plans to extend into many more major markets. 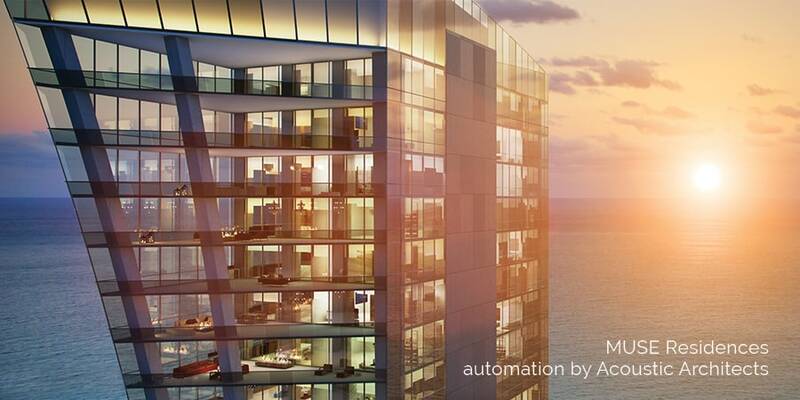 If you would like to learn more about fully automated luxury condos, feel free to contact us at Acoustic Architects. We will be happy to get you connected. Sign up for Property Markets Group X Communities newsletter at xliving.co to see when we’re opening near you.